Riverfront living at its finest! Imagine watching the sun come up over the river as you enjoy breakfast on the outdoor patio. Take a look out the window and see a beautiful mountain view with the river only a few feet away. Walk over to Riverstone for some shopping, a movie, or a bite to eat from a great selection of restaurants. Whatever you choose, this condo is the perfect place to experience all that Coeur d'Alene has to offer! Luxurious and comfortable, this home boasts hand-scraped hardwood floors, granite counters throughout, a gourmet kitchen with a butcher block island, an indoor and outdoor fireplace, and an attached garage. The master suite has stellar views of the water and access to the outdoor patio. The master bath has a double vanity, walk-in tile shower, and a jetted tub. A forced air natural gas furnace with A/C keeps the home warm in the winter and cool in the summer. The two gas fireplaces, one in the living room, and one on the patio, provide a nice touch of ambiance for late evening relaxation. Off-site parking for boat trailer available upon request at no additional charge. Conveniently located in the Courtyard development at Riverstone, there is plenty to see and do within walking distance from the condo. A 14 screen movie theater, shops, restaurants, and Riverstone Park comprise the Riverstone Development. If you feel up for a bike ride, the Centennial Trail bike path runs right by and will lead you all the way into downtown Coeur d'Alene and the Couer d'Alene Resort. Take a stroll down Sherman Ave to experience even more shopping, art galleries, and restaurants. 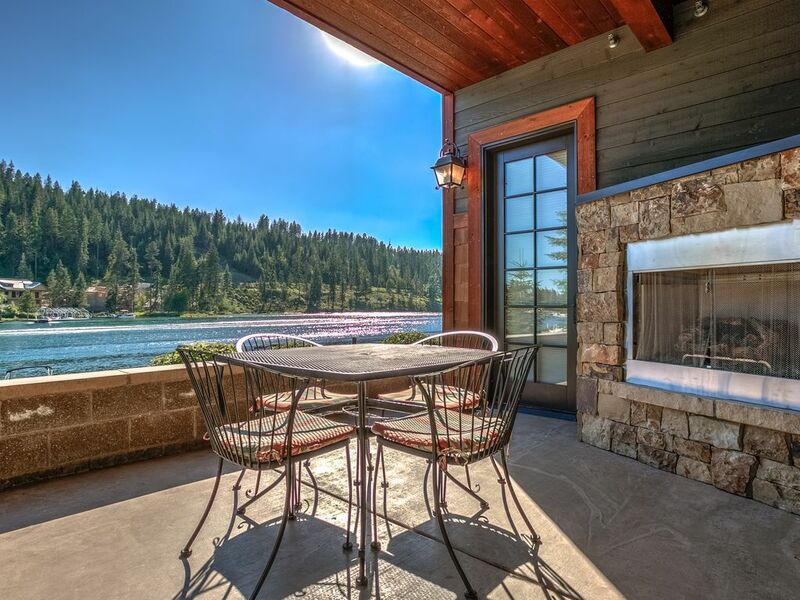 Come see what it's like to live on the river in beautiful Coeur d'Alene, Idaho! Incredible river views from the living and dining room, master bedroom, and outdoor patio. Just steps from the Spokane River coming out of Lake Coeur d'Alene. Indoor gas fireplace. Outdoor gas fireplace on patio. River views, access to patio, ceiling fan, flat screen TV and DVD player. Jenn-Air stainless steel side by side refrigerator. Jenn-Air professional stainless four burner gas range and oven. Mr. Coffee 12 cup pot. Blender, bottle opener, cook and bake ware. Granite counters, porcelain farm house sink, knotty alder cabinets, butcher block island bar, and tile backsplash. Beautiful circular wooden table with high back leather chairs. Flat screen with HDMI input. Ski boat available to rent. One step up to front door. Roll in from garage. Low threshold shower in master bath. Could not have been more beautiful! Beautiful condo on the water! Great place! Awesome location, close to where you want to be. Very nice owner. It’s a very nice place!! It’s VERY clean & just as beautiful as the pictures. Loved the location of this condo. A beautiful home in a lovely setting. This condo definitely lives up to the way it is advertised! Fist, the location is excellent. It is close to a very nice shopping center and steps from the Centennial Trail for biking, walking and running. The river views are lovely and it is just steps from the patio down to the dock and walking path that follows the river. The complex and unit are very well built and maintained. The patio with fireplace and large barbecue is a lovely place to enjoy the views, relax and dine. We spent a lot of time there but also enjoyed one dinner at the large dining table inside. The layout is perfect for 2 couples although there is quite a bit of difference in the size of the two bedrooms and bathrooms. The larger bedroom has wonderful views of the river and the ensuite bath has double sinks, large jetted tub and separate shower.....very comfortable! The kitchen is well equipped and has high-end appliances. We prepared most of our meals there. We all enjoyed our stay very much and look forward to returning next summer.